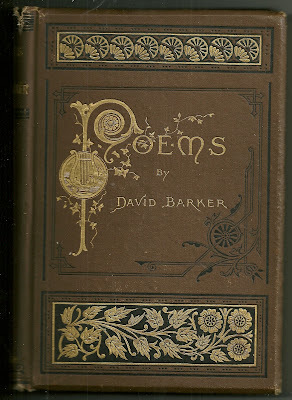 Some time ago I found an 1800s book of poetry by Maine-born David Barker but put it on the back burner because scanning an old book is time-consuming and possibly destructive to the binding. But now, with the new Flip Pal scanner in hand, this book seemed to be a good test. 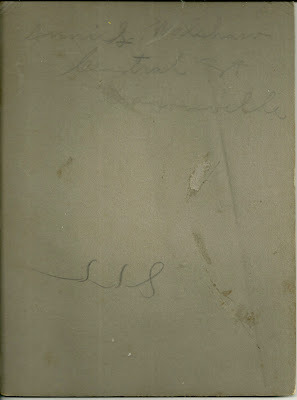 I bought the Flip Pal for old books like this, for 19th century autograph books and for other delicate items. Some of the poems are hilarious, some are poignant, and some concern actual people. I'll post some of the poems in the future. 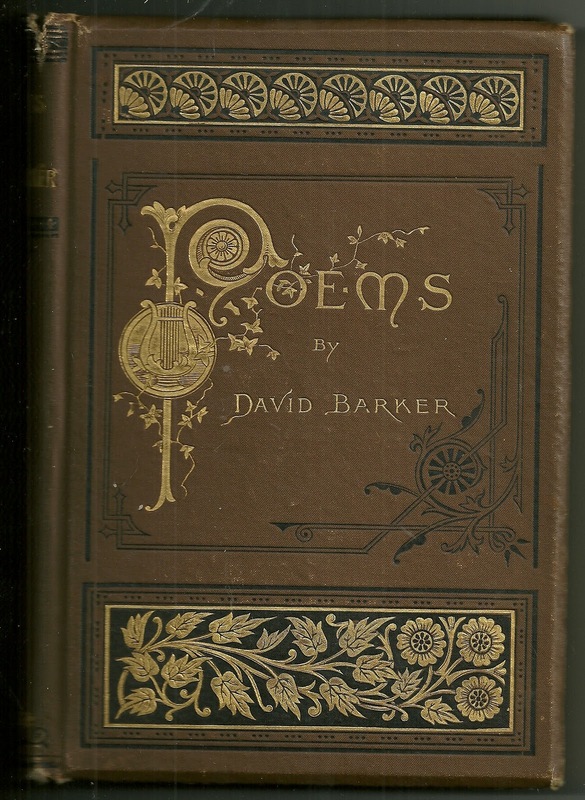 At the beginning of the book is a short biography of David Barker by Hon. John E. Godfrey, the pages of which I've scanned below, both at 300 dpi and at 600 dpi. I'd appreciate it if you'd let me know if the 300 dpi will suffice. Bear in mind, that I got better at scanning the farther I went along, and I did all the 300 dpi pages first, so they were the guinea pigs. The biography portion of the book is now scanned, and the book is no worse for wear, so, for me, purchasing a Flip Pal has turned out to be a good investment. The fact that I can turn the Flip Pal over and rest it atop delicate items to scan them is terrific. 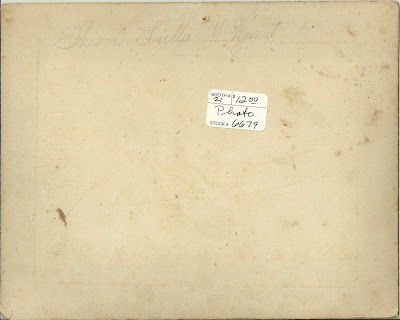 My next project will be an 1800s autograph book, with pages small enough for one pass. Even though I understand there's an easy stitching program, I'd definitely buy a larger Flip Pal, should the company develop one. David Barker was born 9 September 1816 in Exeter, Maine, the son of W. Nathaniel and Sarah (Pease) Barker. I don't have any information as yet on Nathaniel's parents. 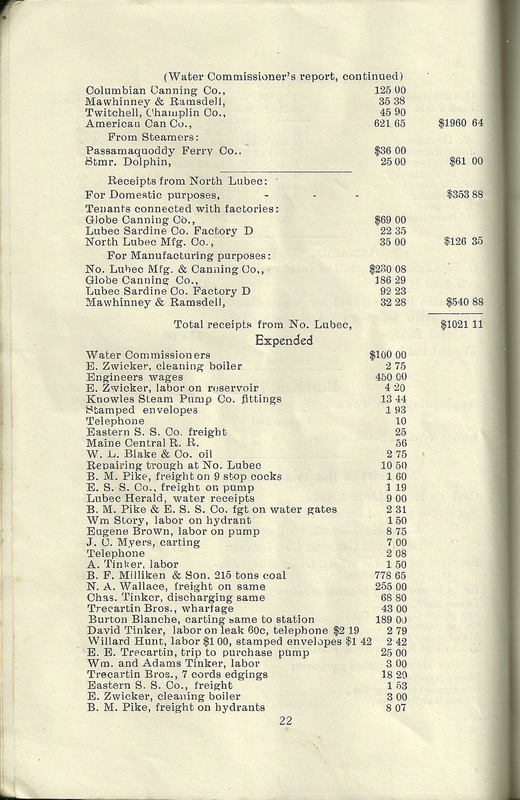 I noticed that many sources online had Nathaniel's death occurring in Exeter, Maine, but the biography above claims that he died in an accident with his team at Bangor, Maine. 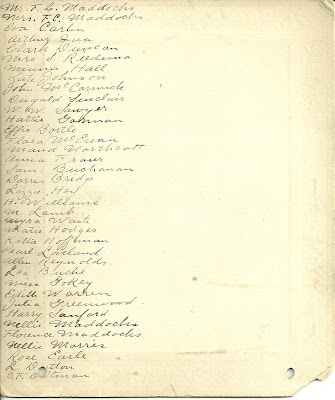 Sarah (Pease) Barker was born 3 Oct 1789, in Parsonsfield, Maine, the daughter of Joseph and Ann Dolly or Polly (Clark) Pease. 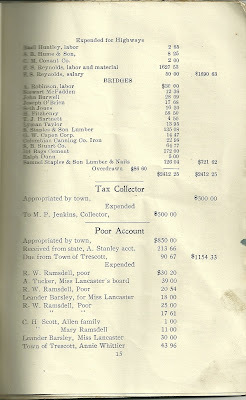 Davd Barker married Susan Chase, the daughter of Timothy Chase, Esquire, of Belfast, Maine. 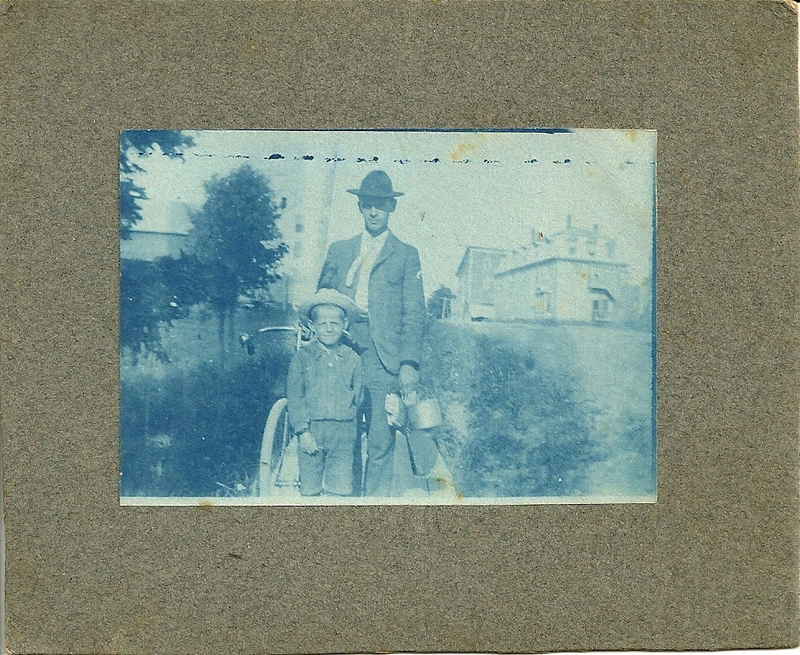 I found at least two children for them: Walter C. Barker, born 1857, and Maud Barker, born 1863. David Barker died at the home of his brother Mark on 14 September 1874. His wife and two children survived him. 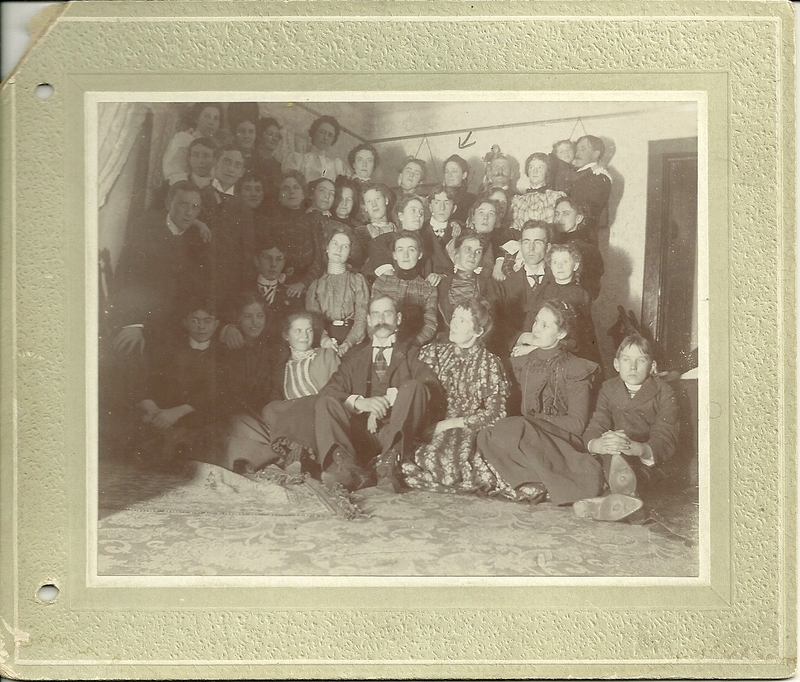 Wonderful photograph of a large group of people, identified but not placed, on the reverse. 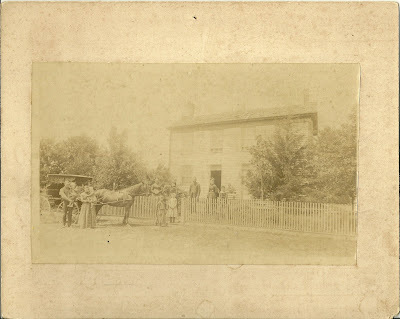 No photographer's imprint to give a clue to the locale, but online research indicates the photograph was likely taken in Michigan. 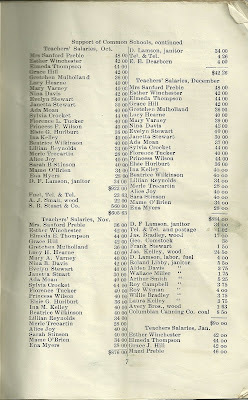 If you are related to or have researched any of these names, please leave a comment or contact me directly. I'd be interested to know the genealogy of the individual people and the reason that brought them all together to have their photograph taken. 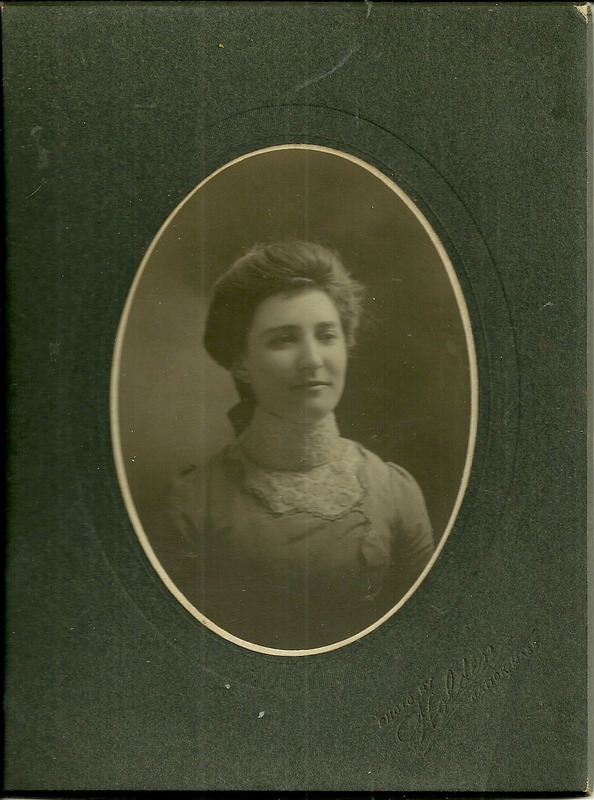 Photograph of a young woman identified on reverse as Annie Walshaw. The photographer's imprint is very faint on lower right front, but I believe I can make out Natick, Massachusetts. 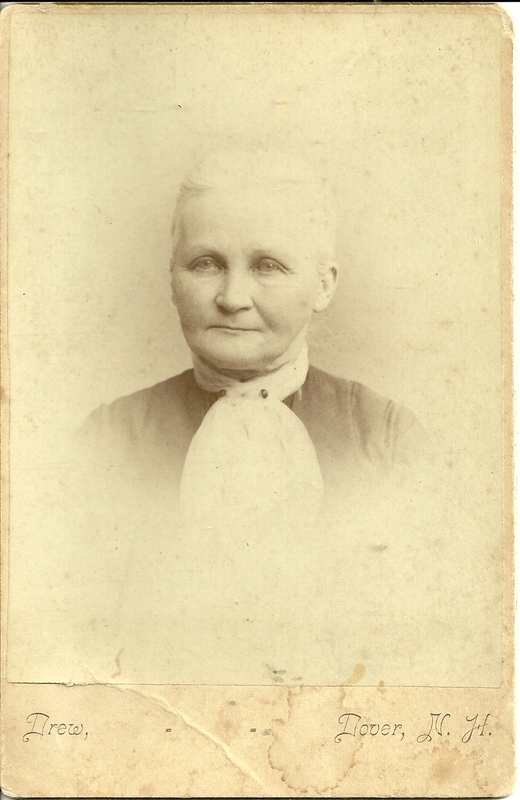 The identification on the reverse, above, reads: Annie S. Walshaw, Central Street, Saxonville. 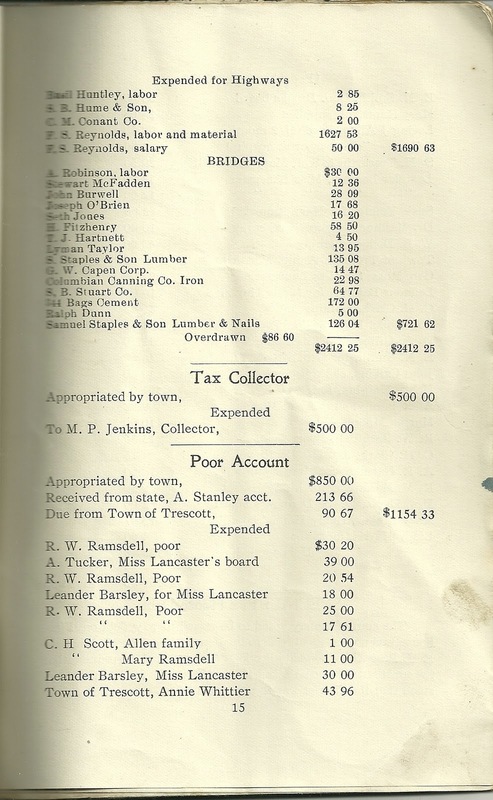 Saxonville was the name of a village in Framingham, Massachusetts, which is next to Natick. 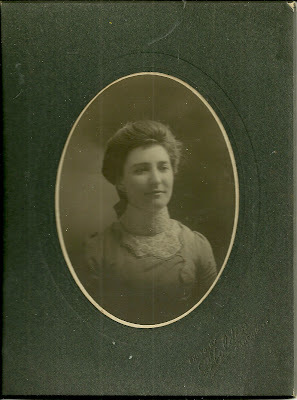 Annie S. Walshaw was born about 1880 in Massachusetts, the daughter of Thomas and Clara Mae (Culverhouse) Walshaw. Her paternal grandparents were William and Selena Walshaw of Yorkshire, England, who emigrated to the United States with their children, including Thomas, who was born about 1855. It's possible that Annie's middle initial may have stood for Selena, as the name persists in the subsequent generations; however, her sister's middle name was Selena as well, so perhaps Annie had a different middle name. Annie's maternal grandparents were Henry and Mary Ann (Entwistle) Culverhouse of England, who also emigrated from England to Massachusetts. Henry arrived at Boston in 1841 with his parents John and Harriet. I'm not sure when Mary Ann Entwistle arrived, and I'm not sure of her parents' names, as there is conflicting information online. 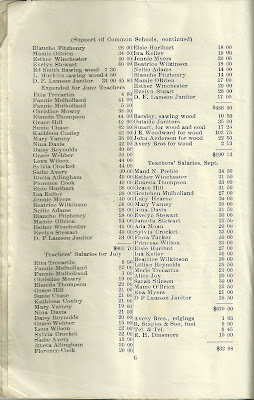 I believe her mother was also a Mary Ann, though, judging from the 1850 Census of Framingham, Massachusetts. 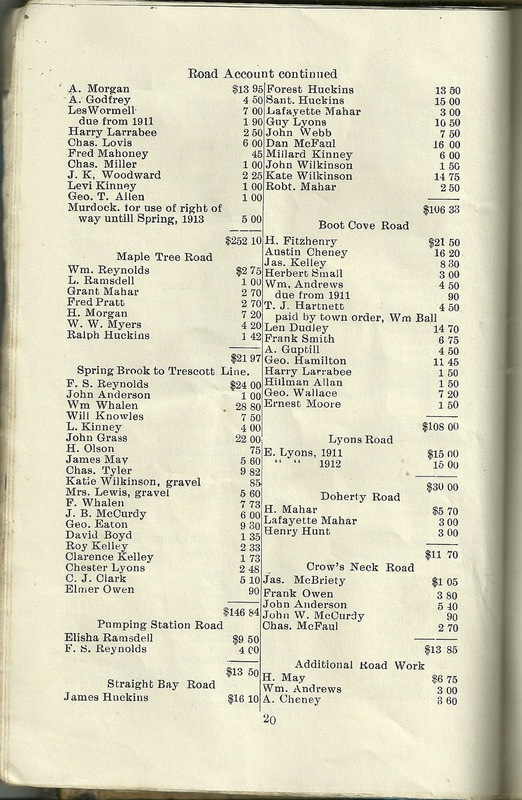 I lost track of Annie after the 1880 Census, when she and her family were living in Matteawan, New York. Hopefully she had a long and productive life. I'm assuming that she had her photograph taken when on a visit to her Culverhouse grandparents. 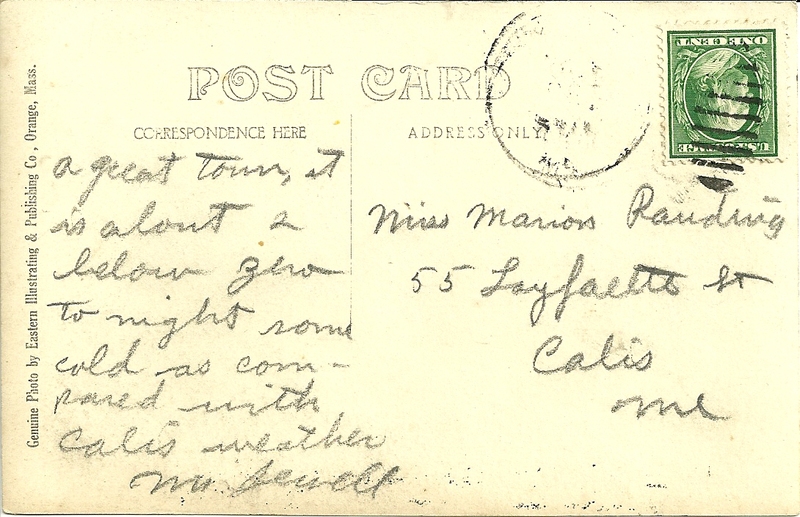 Her sister, Bessie Selena Walshaw, married Frank H. Gay and, after Frank died, Clayton Johnson, and raised her family in Illinois. Cabinet photograph of toddler William T. Graham taken by the Lamson studio of Portland, Maine. Lydia M. Cartland, Isaiah Cartland's sister, who became the second wife of William Penn Tuttle of the Tuttle Farm of Dover, New Hampshire. 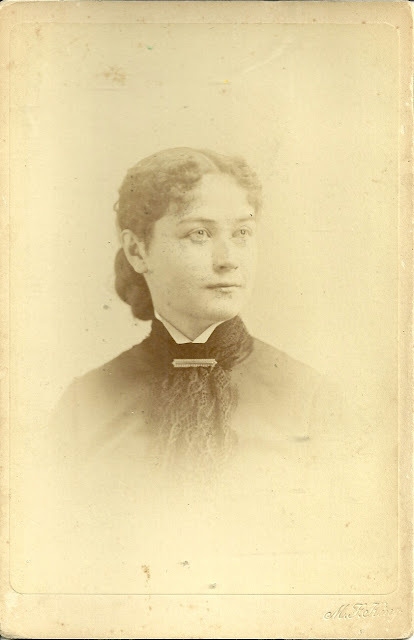 Mary Rich Cartland, wife of William Graham and mother of William T. Graham. Two of the photographs mention Ruth, daughter of William T. Graham, so before they ended up in an antique shop, they must have been in the possession of a relative or friend of Ruth Graham. William T. Graham was born 30 December 1879 and died 21 September 1927. I believe he was born in Manchester, New Hampshire, the son of William Graham of Scotland and Mary Rich (Cartland) Graham. 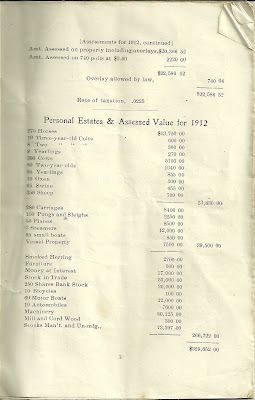 On 24 April 1907, William T. Graham married Lucy Ellen Cartland, who was his second cousin. They shared great grandparents Charles and Miriam (Robinson) Cartland. 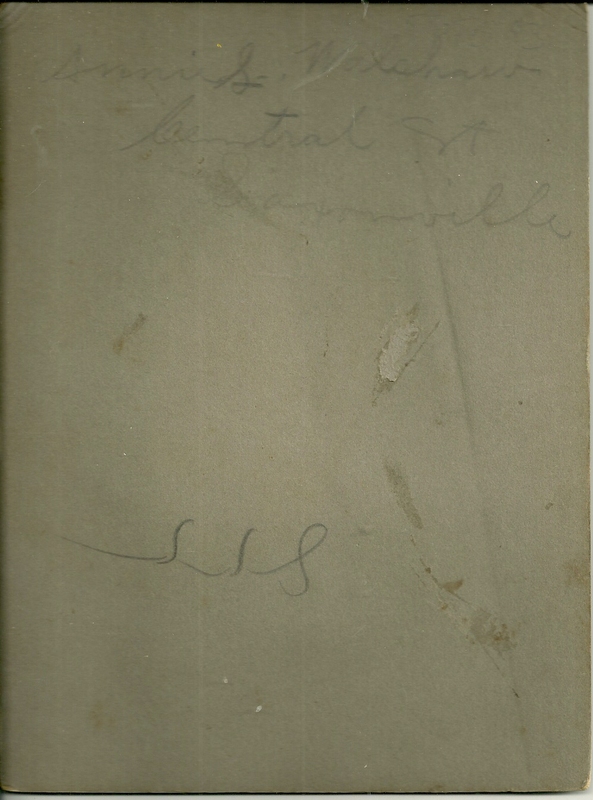 Lucy Ellen Cartland was born 11 December 1879 in Brunswick, Maine, the daughter of Charles and Frances Ellen (Tracy) Cartland. 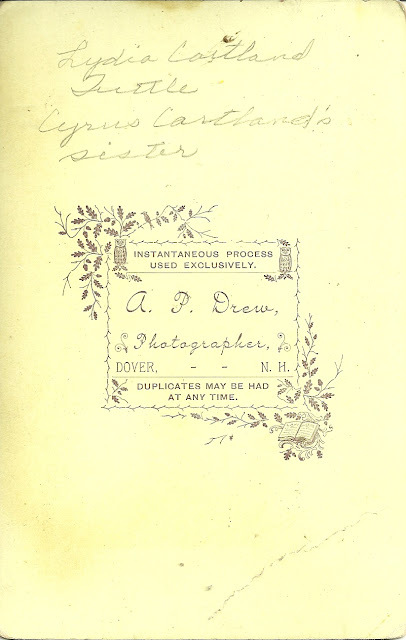 Her paternal grandparents were Cyrus and Phoebe Rogers (Jones) Cartland. 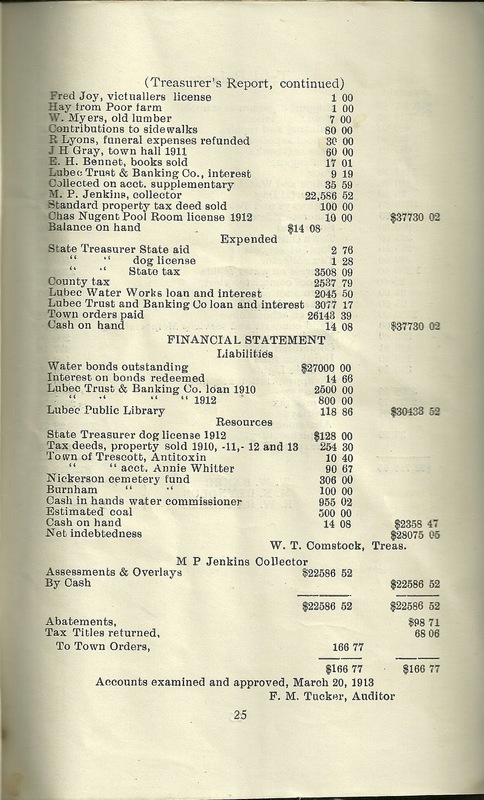 Her maternal grandparents were John Orr Tracy and his wife Octavia (Philbrook) Tracy. 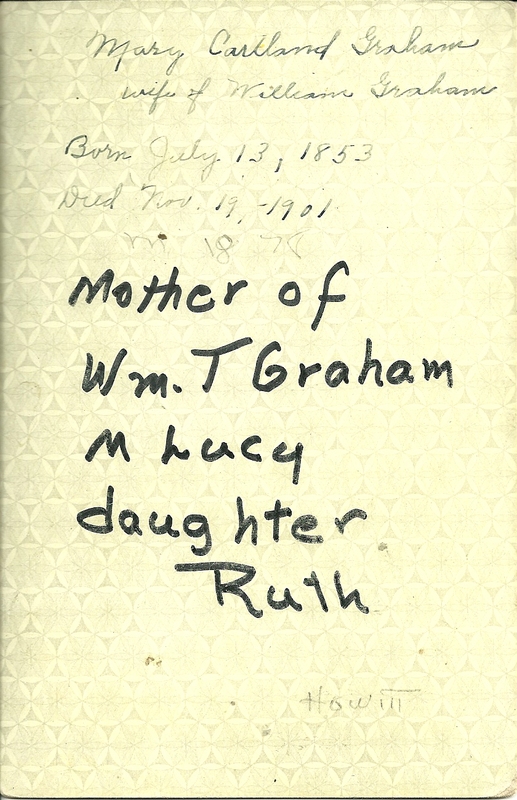 William T. and Lucy Ellen Graham had at least two children, one of them being the Ruth mentioned on the reverse of two of the photographs in the collection, this one and that of Mary Rich (Cartland) Graham. 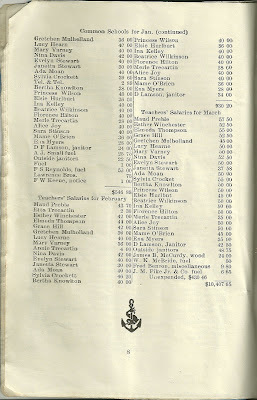 See the page for William T. Graham and his wife Lucy Ellen Cartland at the Maine and Maritime Canada Genealogy network. 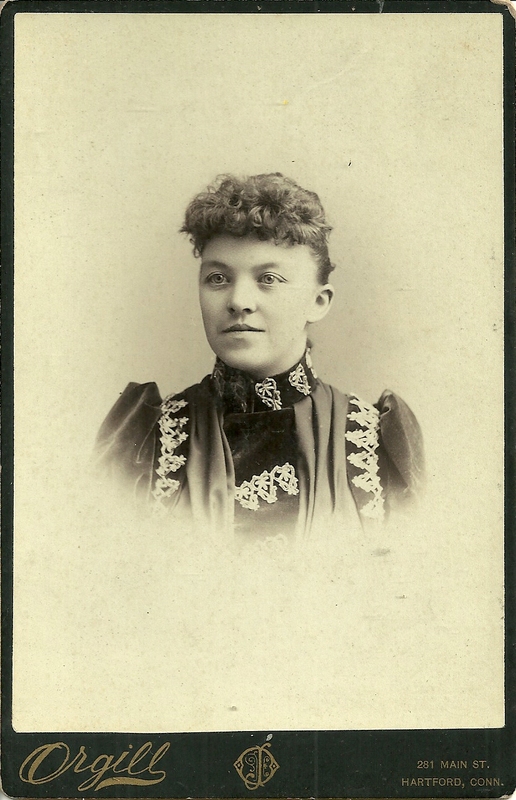 Cabinet photograph of Mary Rich Cartland, taken by M. F. King studio of Portland, Maine. 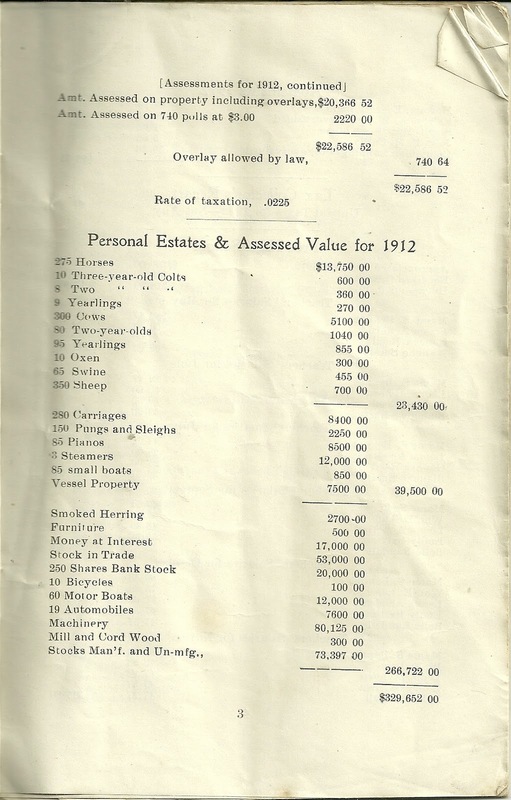 Mary was the daughter of Isaiah Cartland, who was discussed in an earlier post today. Lydia M. Cartland, Isaiah's sister, who became the second wife of William Penn Tuttle of the Tuttle Farm of Dover, New Hampshire. 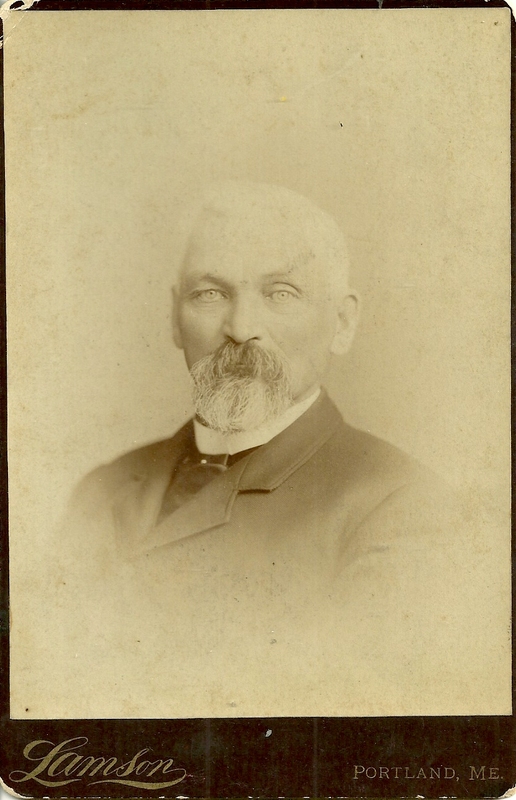 William T. Graham, son of Mary Rich (Cartland) Graham and husband William Graham. He married Lucy Ellen Cartland, his second cousin, I believe. 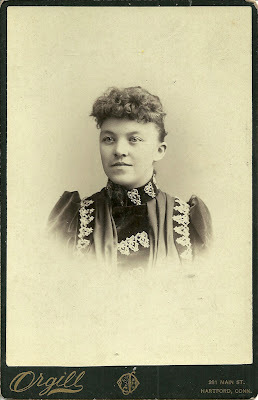 Mary Rich Cartland was born 13 July 1853 in Brunswick, Maine, the daughter of Isaiah and Eunice Hacker (Rich) Cartland. 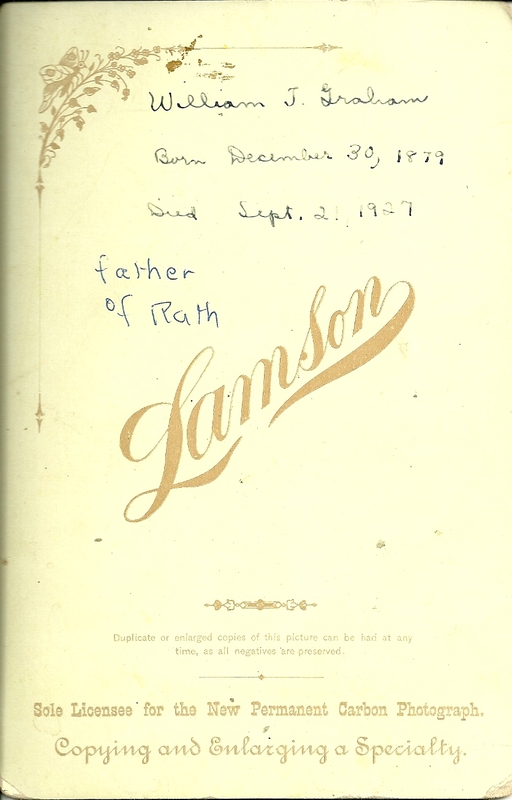 Her paternal grandparents were Charles and Miriam (Robinson) Cartland. 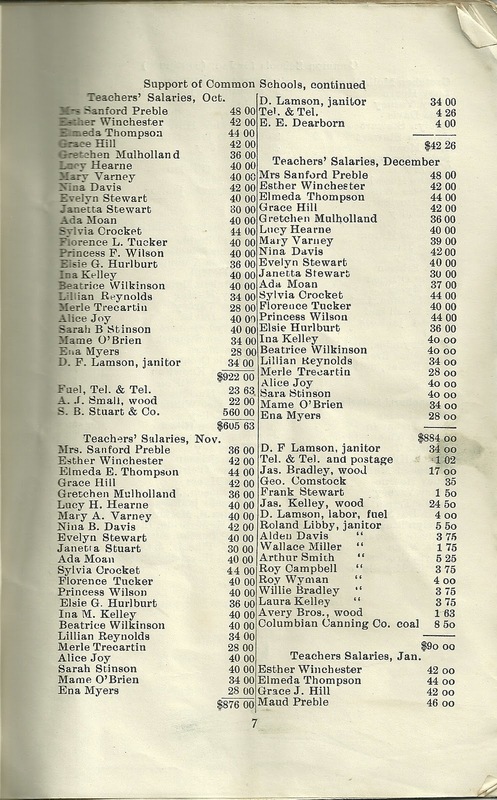 Her maternal grandparents were Thomas and Eunice (Jones) Rich. 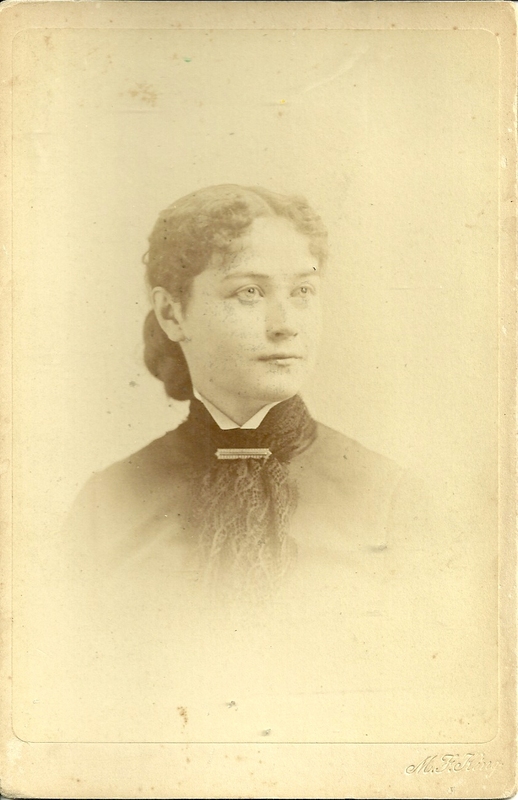 Mary married William Graham in 1878. I believe he was born in Scotland about 1853 and that he came to the United States about 1856, but other than that I have no information on him as yet. As the reverse of the photograph indicates, one of the children of Mary and William was William T. Graham. I believe there were two more children, Eunice and Paul Gordon, and that the family lived in Portland, Maine, or the Portland area. Mary died fairly young on 19 November 1901. 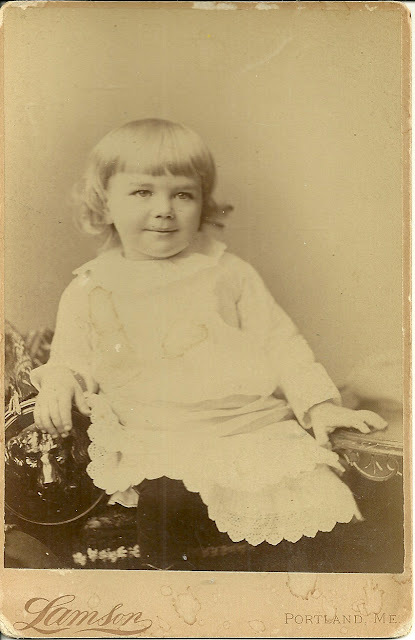 I'll discuss her son William T. Graham, photographed as a toddler, in my next post. 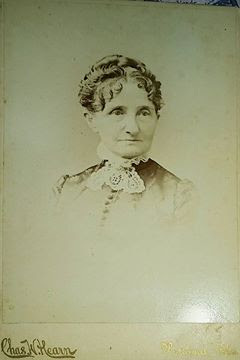 Cabinet photograph of Lydia Cartland by the Drew studio of Dover, New Hampshire, so likely taken after her 1872 marriage to William Penn Tuttle of the famed Tuttle Farm of Dover, New Hampshire. Mary Rich (Cartland) Graham, Isaiah's daughter who married William Graham. The ID gives birth and death dates for Mary. Lydia M. Cartland was born 20 October 1831 in Windham, Maine, the daughter of Charles and Miriam (Robinson) Cartland. Her paternal grandparents were Pelatiah and Anna (Hanson) Cartland. 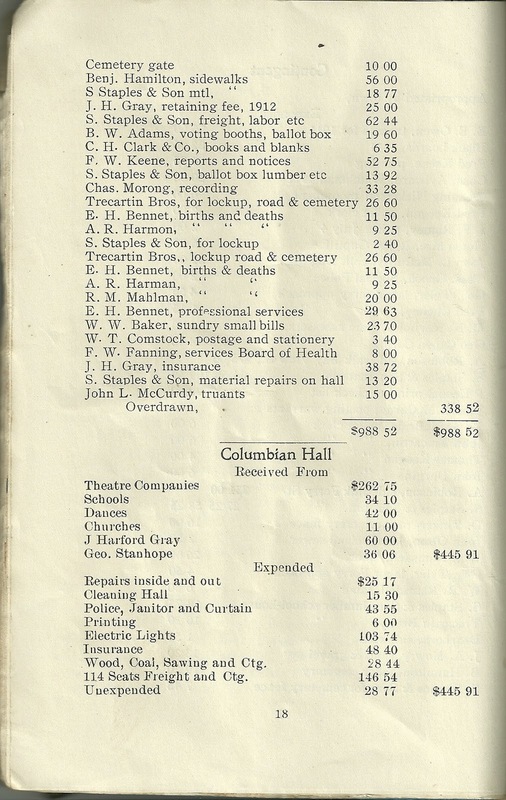 Her maternal grandparents were Stephen and Content (Alley) Robinson. In 1872, Lydia became the second wife of William Penn Tuttle, who was born and died on the Tuttle Farm in Dover, New Hampshire. 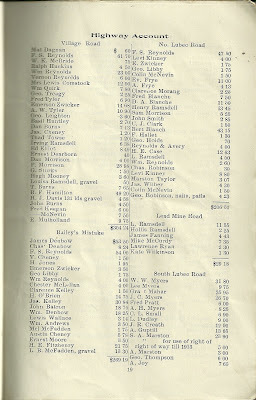 He was born 26 June 1823, the son of Joseph and Sarah (Pinkham) Tuttle. 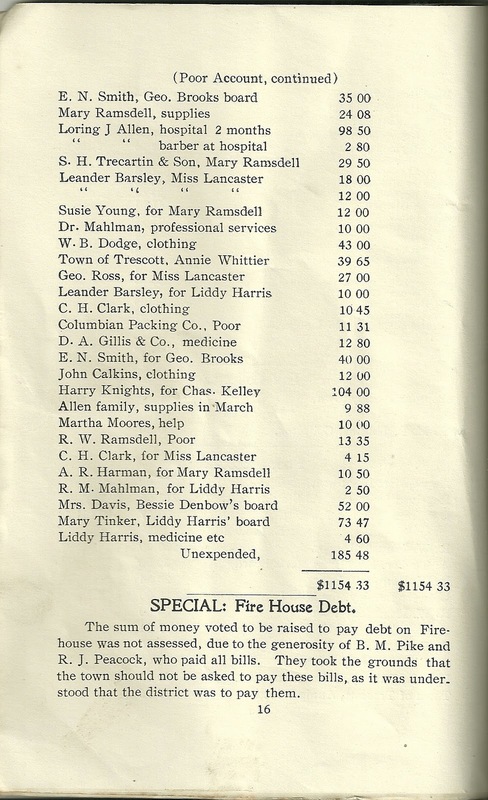 His paternal grandparents were William and Anna (Hanson) Tuttle. 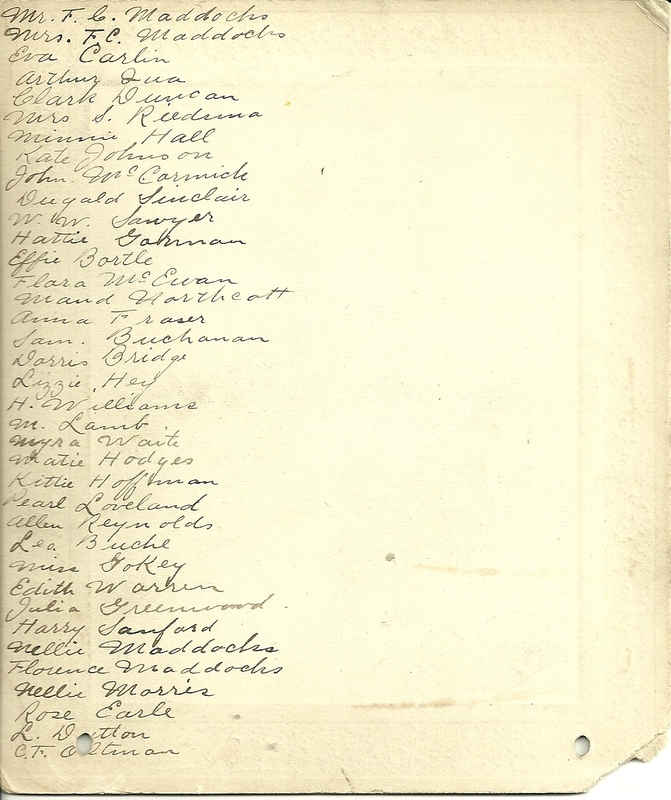 His maternal grandparents were Joseph and Elizabeth "Betsey" (Green) Pinkham. William Penn Tuttle had a son from his first marriage to Mary Varney, but that child died young. Lydia died in 1898, and William then married Hannah Coffin Hanson. 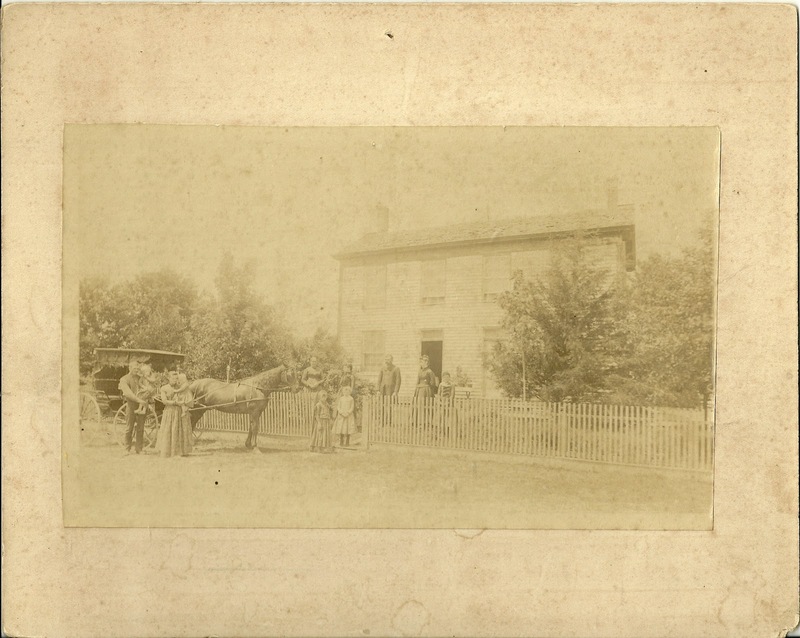 After his death in 1910 or 1911, the farm passed to his nephew George W. Tuttle, who had been managing it for some years before then. 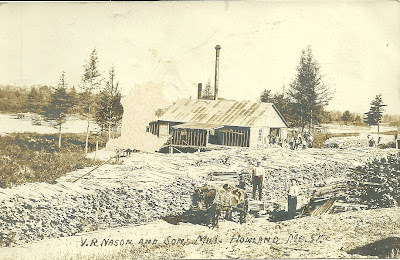 Vintage Real Photo Postcard showing the V. R. Nason and Son Mill in Howland, Maine. 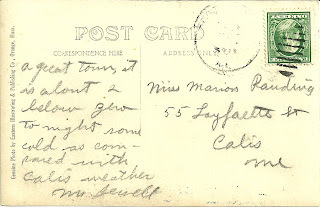 The card was sent to Miss Marion Rawding in Calais, Maine, and was found in a collection of postcards addressed to Marion in the 1910s and 1920s era, before she married Alton Dinsmore. Unfortunately, I can't make out the cancellation on this particular card. Researching online, I found that V. R. Mason was Van Rensselaer Nason, who was born 15 September 1844 in Maine, the son of Beniah and Dianna (Inman) Nason of Howland and Maxfield, Maine. 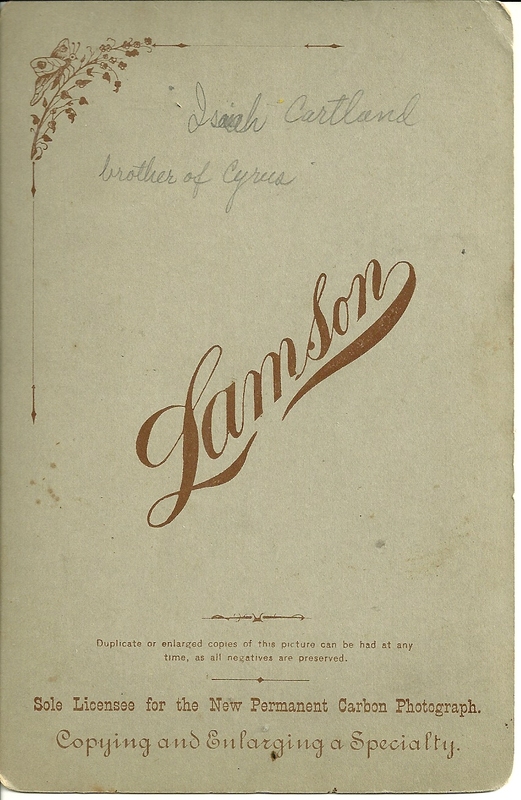 According to a Nason researcher, misinformation about this family abounds in online trees. 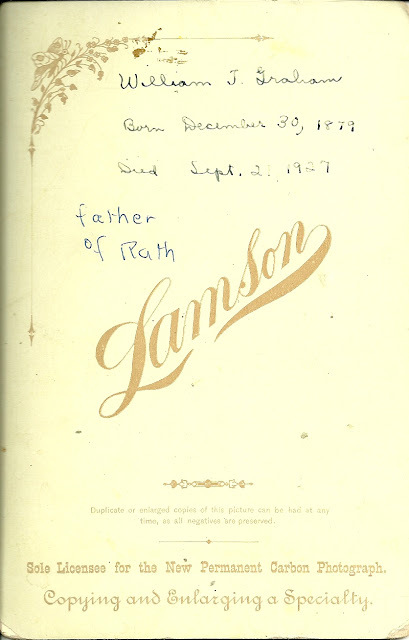 It's very likely that Robert Nason was the grandfather of Beniah Nason, whereas many online trees have him mistakenly as Beniah's father. Also unsourced, but likely, are Duty and Sally Antoine (Lachance or Lashon) as the parents of Dianna Inman. Van Rensselaer Nason's first marriage, to Josephine Kneeland, ended in divorce. She died in Washington state in 1925. 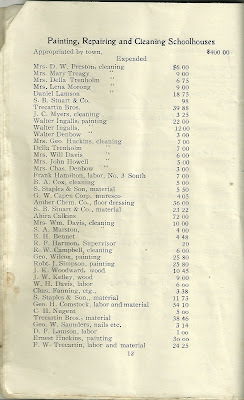 In 1878 Van Rensselaer married Etta J. Phillips, who was born March 1862 in Maine, the daughter of Russell and Julia (Whitney) Phillips. 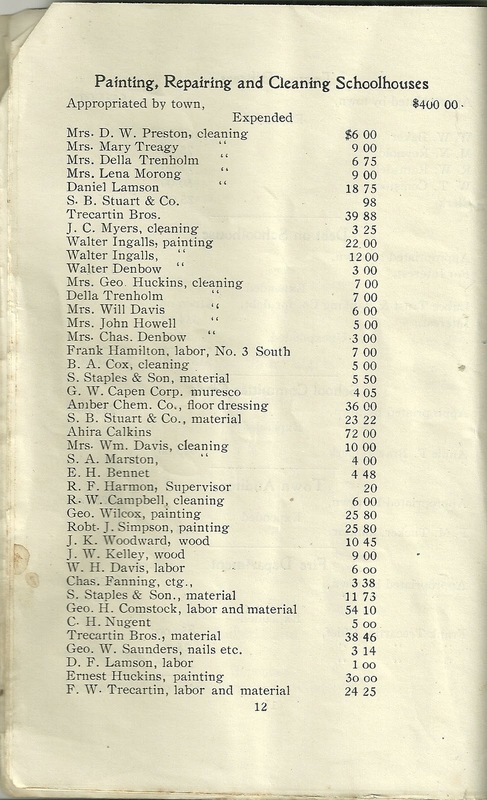 Etta's paternal grandparents were William and Betsey (Stetson) Phillips. 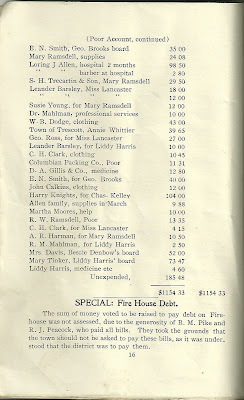 Her maternal grandparents were Reuben and Mary Whitney. 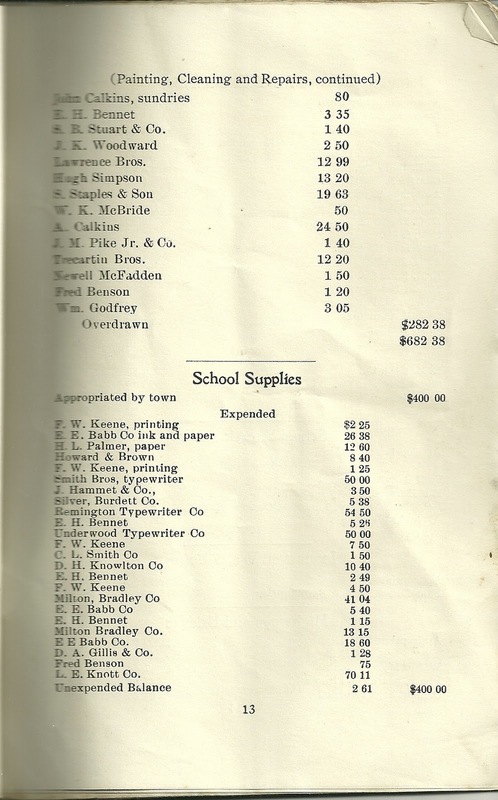 I'd especially like to know where in Howland this mill was located. 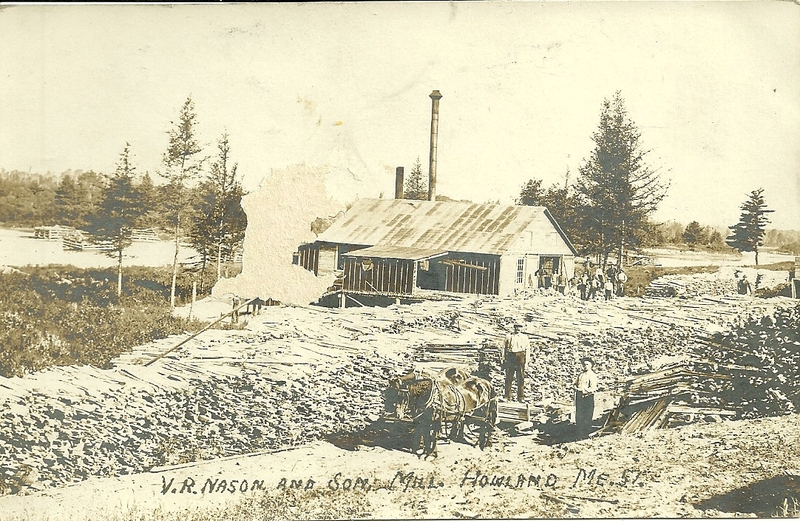 Howland, situated at the confluence of the Piscataquis and Penobscot Rivers, has many suitable locations for a mill. Photograph of a man and boy identified on reverse as Frank Orcutt and Charles Catchum, which I'm assuming could also be a misspelling of Charles Ketchum or Charles Ketcham. 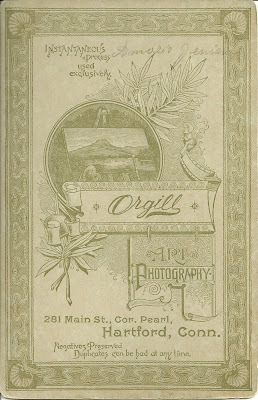 The photograph was purchased in Maine, and there are plenty of choices for a Frank Orcutt in that state, but there's no guarantee that the photograph was taken in Maine. There's an interesting building in the background that may be recognizable to a reader, who, with any luck, may also be familiar with the Orcutt and Ketchum surnames. If you have any insights into the Frank Orcutt or Charles Catchum or Ketchum pictured above, please leave a comment in the comments box or contact me directly. 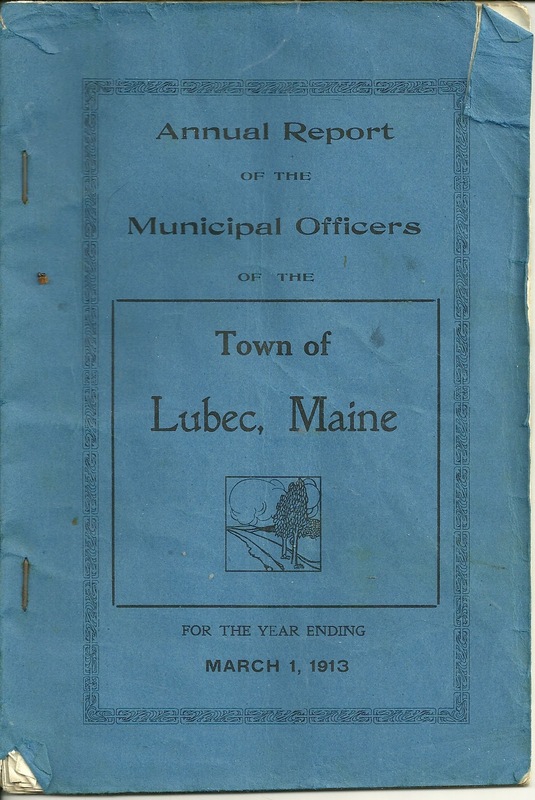 Annual Report of the Municipal Officers of the Town of Lubec, Maine, for the Year Ending March 1, 1913. Many of the names of people within are repeated, some many times, but I'll list them all at least once, if not more. 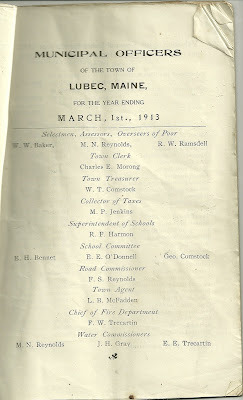 Municia; Officers of the Town of Lubec, Maine, for the Year Ending March, 1st, 1913. Capt. 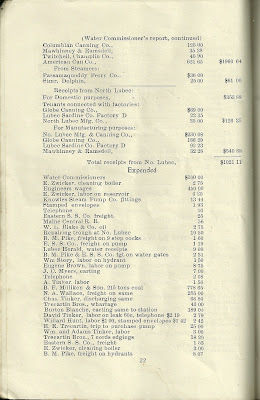 John A. Davis for G. A. R.
S. B. Stuart & Co.
J. M. Pike Jr. & Co.
D. A. Gillis & Co.
C. H. Clark & Co.
Charles H. Gillman & Co. 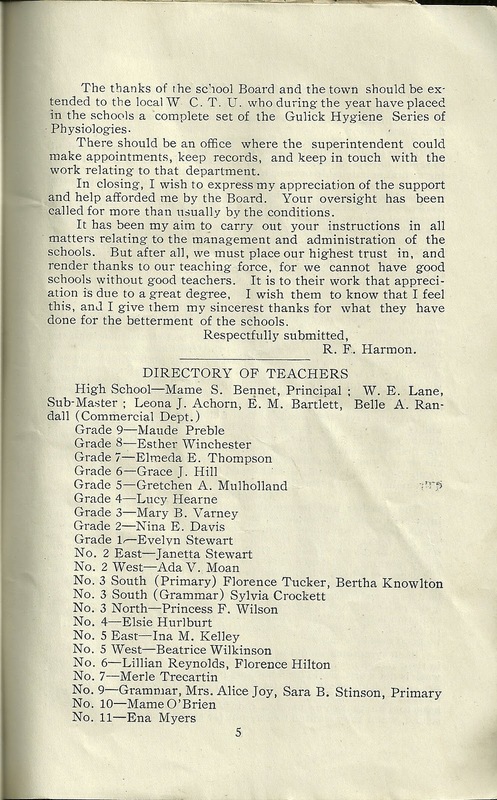 The last few pages are the School Superintendent's Report and Report of the Principal of High School. 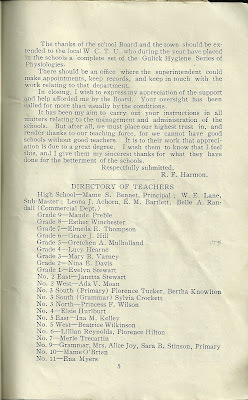 First, the School Superintendent's Report. 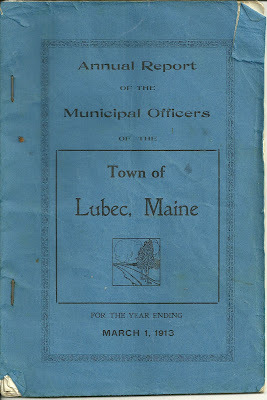 Gentlemen; - I hereby submit my first annual report as Superintendent of schools of the town of Lubec. Owing to the comparatively short term I have served in this capacity, my suggestions must be somewhat limited. 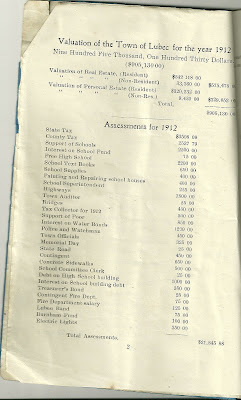 The general condition of the schools seems to be satisfactory and the administrative methods of previous years have not been changed to any appreciable extent. 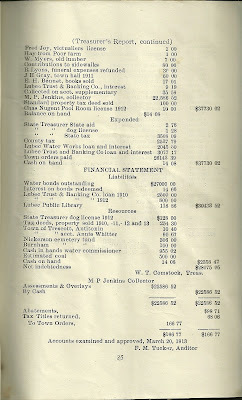 The course of study adopted some years ago has been used in part of the grades, while it is planned to have a revised outline prepared for use at the beginning of the fall term. 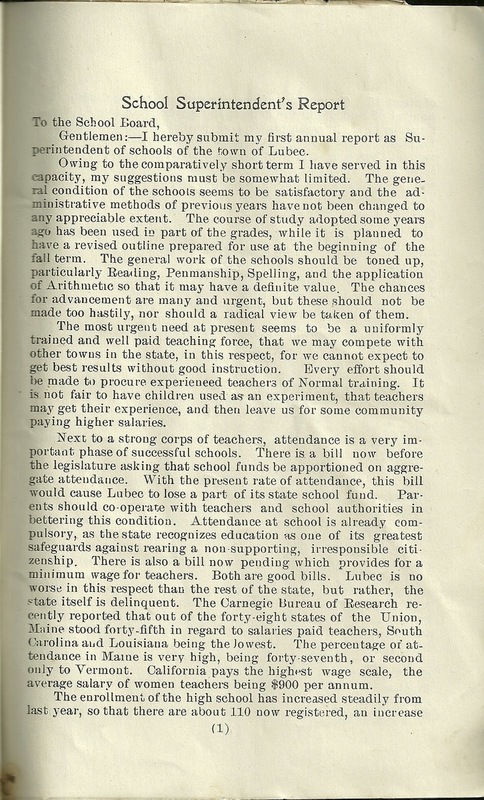 The general work of the schools should be toned up, particularly Reading, Penmanship, Spelling, and the application of Arithmetic so that it may have a definite value. The chances for advancement are many and urgent, but these should not be made too hastily, nor should a radical view be taken of them. 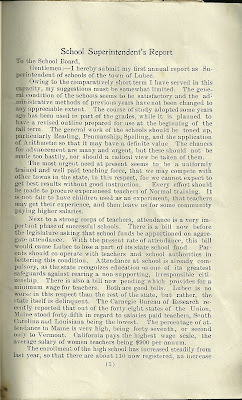 The most urgent need at present seems to be a uniformly trained and well paid teaching force, that we may compete with other towns in the state, in this respect, for we cannot expect to get best results without good instruction. Every effort should be made to procure experienced teachers of Normal training. 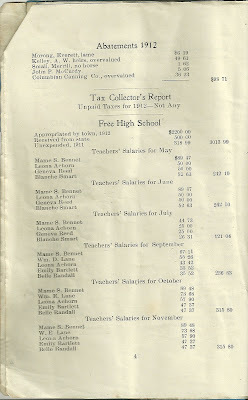 It is not fair to have children used as an experiment, that teachers may get their experience, and then leave us for some community paying higher salaries. Next to a strong corps of teachers, attendance is a very important phase of successful schools. There is a bill now before the legislature asking that school funds be apportioned on aggregate attendance. 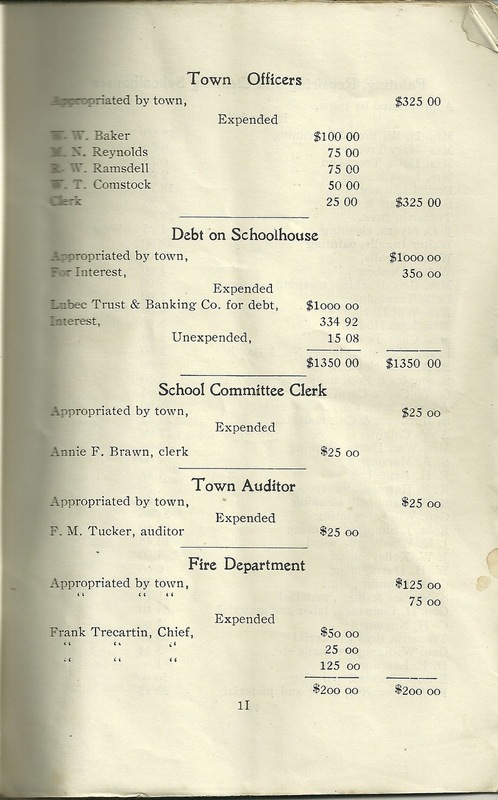 With the present rate of attendance, this bill would cause Lubec to lose a part of its state school fund. Parents should co-operate with teachers and school authorities in bettering this condition. Attendance at school is already compulsory, as the state recognizes education as one of its greatest safeguards against rearing a non-supporting, irresponsible citizenship. 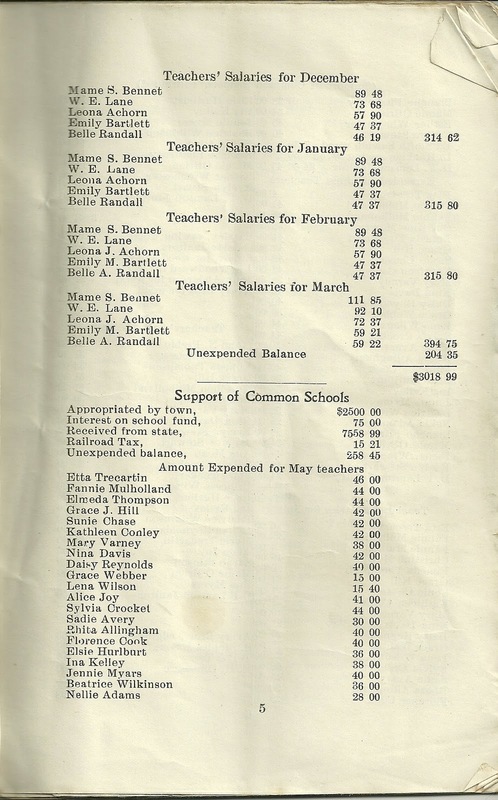 There is also a bill now pending which provides for a minimum wage for teachers. Both are good bills. 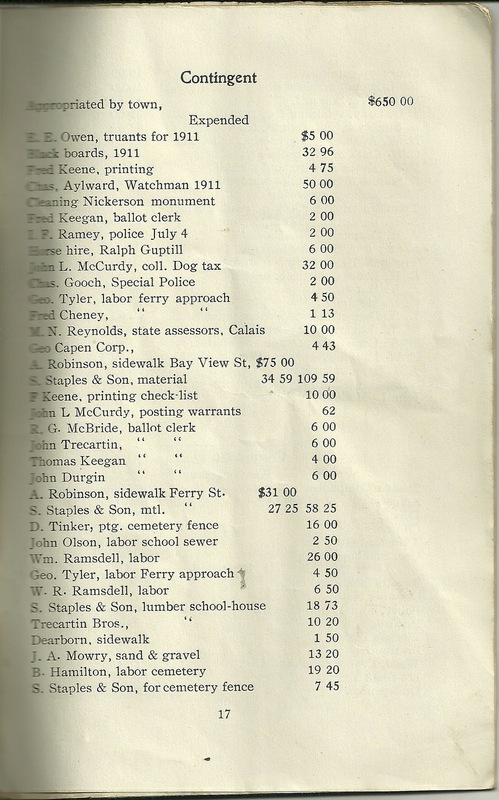 Lubec is no worse in this respect than the rest of the state, but rather, the state itself is delinquent. 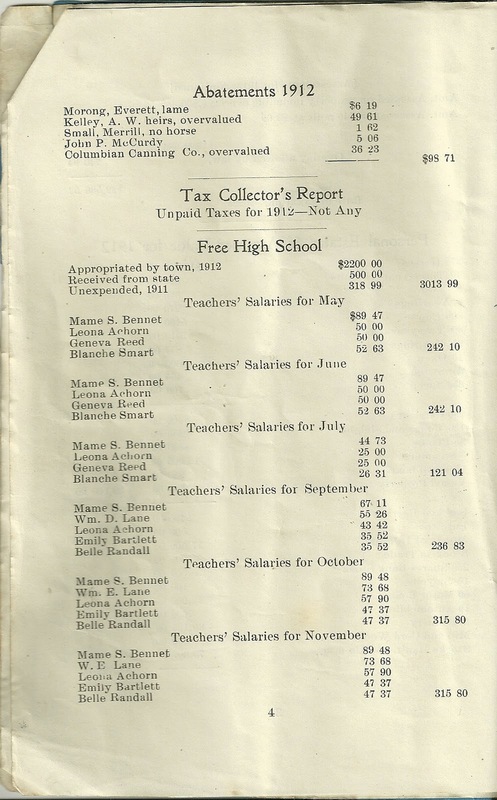 The Carnegie Bureau of Research recently reported that out of the forty-eight states of the Union, Maine stood forty-fifth in regard to salaries paid teachers, South Carolina and Louisiana being the lowest. 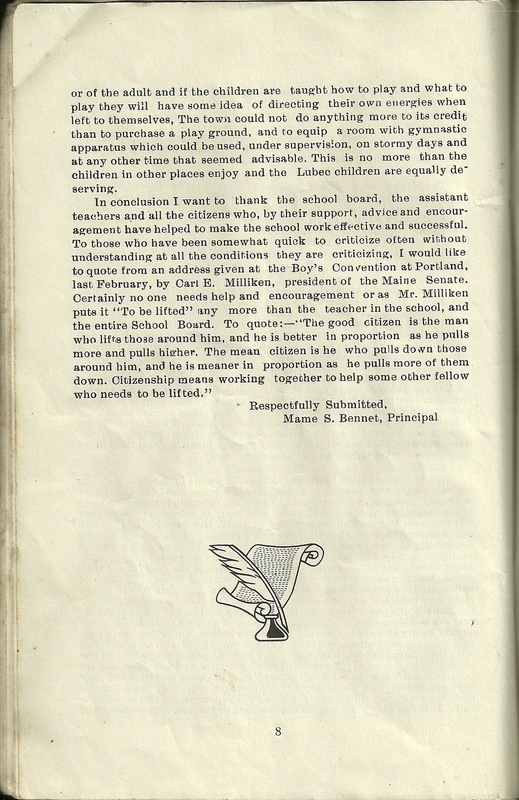 The percentage of attendance in Maine is very high, being forty-seventh, or second only to Vermont. California pays the highest wage scale, the average salary of women teachers being $900 per annum. of about 15. Comparison of the present senior class with the number of students in the class at the beginning of the fall term forces us to face a great problem of providing accommodations for them. Three new typewriters have been added to the Commercial Department, which, though comparatively now, is deservedly popular, and will continue so. The teachers have all worked hard and thoroughly, and the results have been good. The new teacher added at the beginning of the fall term has greatly strengthened the work of the school, which is growing fast, and is already the largest in numbers of any high school this side of Bangor, with the possible exception of one. There are about 55 students who attend from out of town districts and I do not believe there is a town in the state that can duplicate this record. 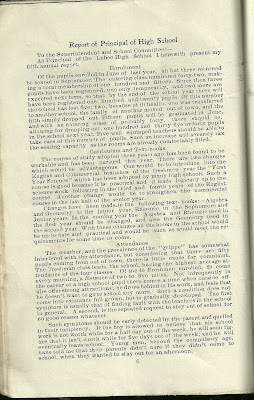 For further information concerning the high school I would refer you to the report of the principal Miss Bennet, who, with the corps of assistants, are to be congratulated on the results obtained. The rooms in the building are crowded in some cases, and in three or four we find an enrolment of over fifty. I do not know that this condition can be alleviated at once, but it is not a desirable one, when you are looking for efficiency. 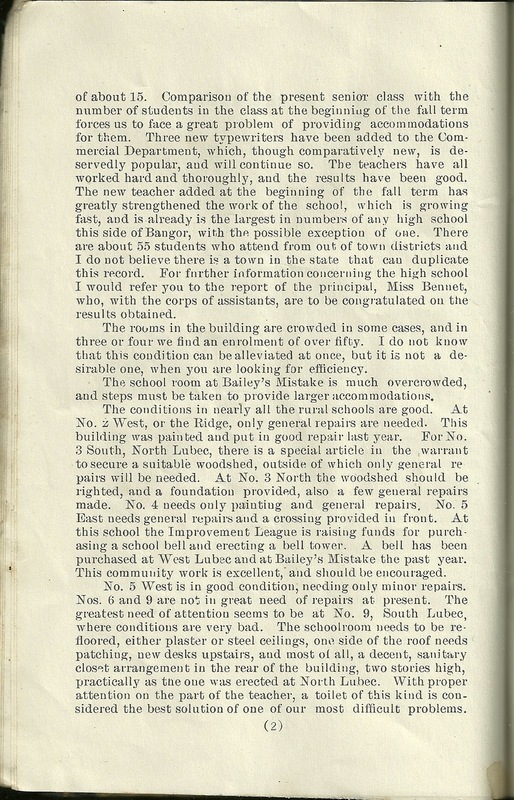 The school room at Bailey's Mistake is much overcrowded, and steps must be taken to provide larger accommodations. 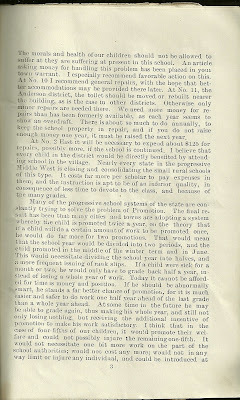 The conditions in nearly all the rural schools are good. At No. 2 West, or the Ridge, only general repairs are needed. This building was painted and put in good repair last year. For No. 3 South, North Lubec, there is a special article in the warrant to secure a suitable woodshed, outside of which only general repairs will be needed. At No. 3 North the woodshed should be righted, and a foundation provided, also a few general repairs made. No. 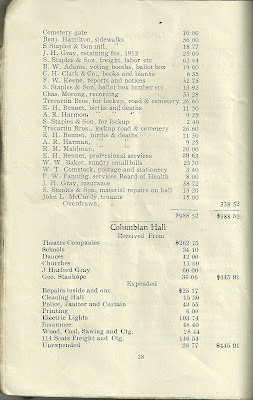 4 needs only painting and general repairs. No. 5 East needs general repairs and a crossing provided in front. 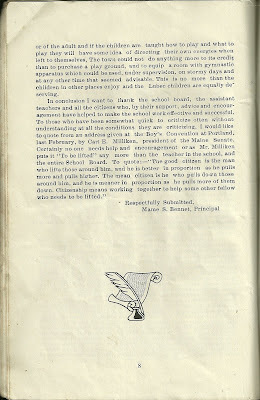 At this school the Improvement League is raising funds for purchasing a school bell and erecting a bell tower. 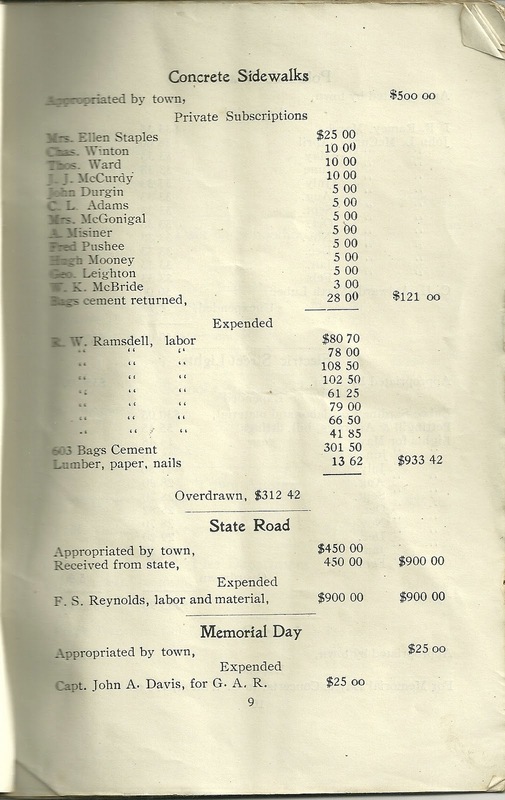 A bell has been purchased at West Lubec and at Bailey's Mistake the past year. This community work is excellent, and should be encouraged. No. 5 West is in good condition, needing only minor repairs. Nos. 6 and 9 are ot in great need of repairs at present. The greatest need of attention seems to be at No. 9 South Lubec, where conditions are very bad. 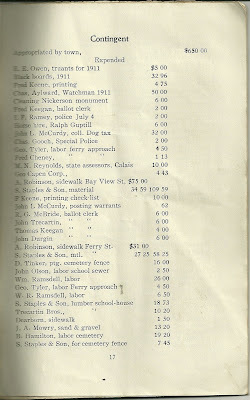 The choolroom needs to be refloored, either plaster or steel ceilings, one side of the roof needs patching, new desks upstairs, and most of all, a decent, sanitary closet arrangement in the rear of the building, two stories high, practically as the one was erected at North Lubec. With proper attention on the part of the teacher, a toilet of this kind is considered the best solution of one of our most difficult problems. 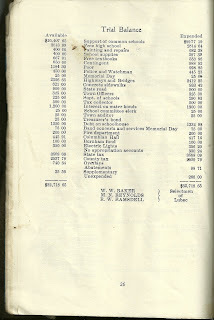 The morals and health of our children should not be allowed to suffer as they are suffering at present in this school. An article asking money for handling this problem has been placed in your town warrant. I especially recommend favorable action on this. At No. 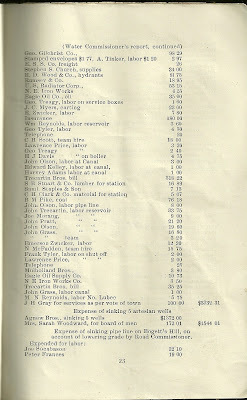 10 I recommend general repairs, with the hope that better accommodations may be provided there later. At No. 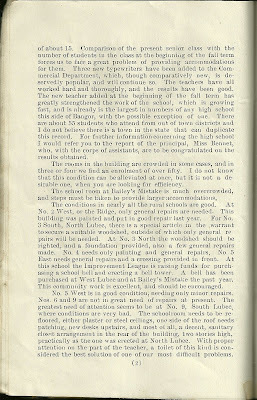 11, the Anderson district, the toilet should be moved or rebuilt nearer the building, as is the case in other districts. Otherwise only minor repairs are needed there. We need more money for repairs than has been formerly available, as each year seems to show an overdraft. 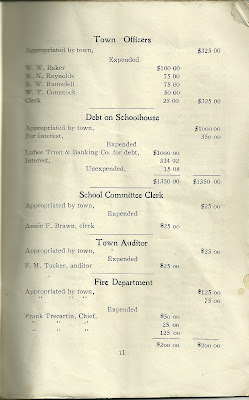 There is about so much to do annually, to keep the school property in repair, and if you do not raise enough money one year, it must be raised the next year. At No. 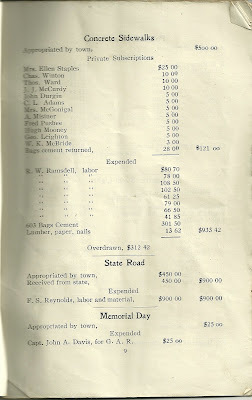 2 East it will be necessary to expend about $125 for repairs, possibly more, if the school is continued. I believe that every child in the district would be directly benefited by attending school in the village. 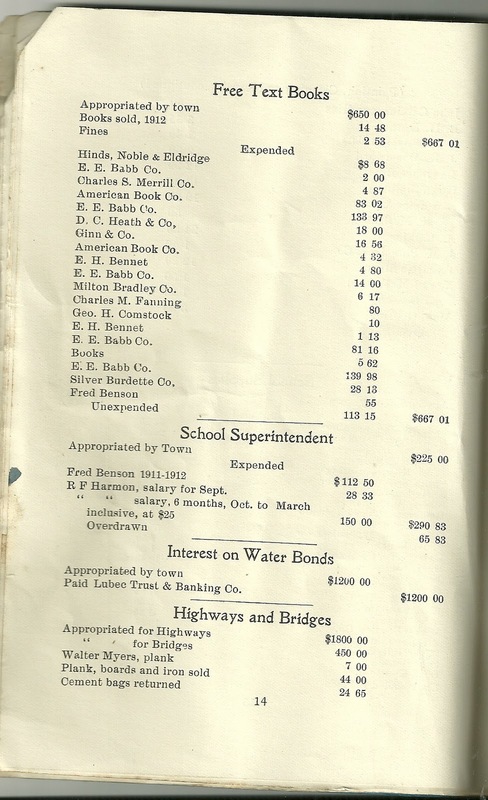 Nearly every state in the progressive Middle West is closing and consolidating the small rural schools of this type. 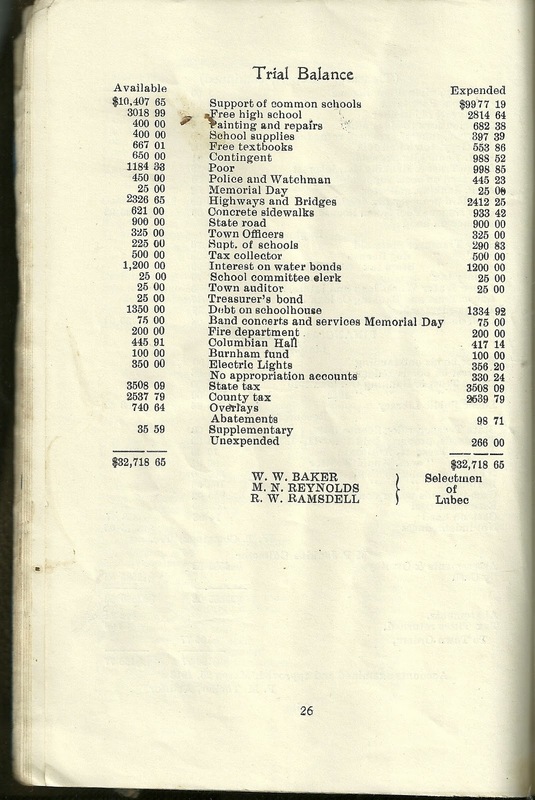 It costs far more per scholar to pay expenses in them, and the instruction is apt to be of an inferior quality, in consequence of less time to devote to the class, and because of the many grades. the beginning of the fall term. It would have a tendancy to hold scholars in school longer; would get them into High School earlier; and graduating earlier, with less drawbacks, would give many more a chance to pursue higher education than are now able. I can see no objection, worthy of note, to this plan, and earnestly recommend that your Board consider it and act soon. There is no system of keeping and preserving ranks, promotions, attendance records, and any other statistics necessary in the schools. 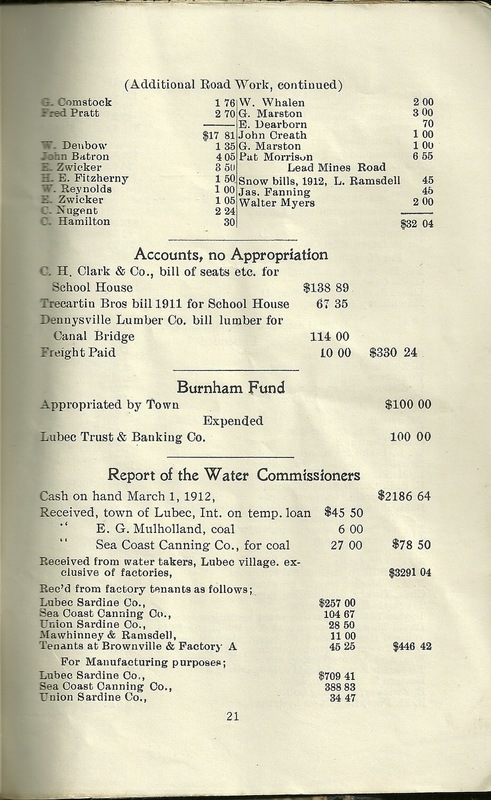 I recommend that your committee take action to install a system suitable to your conditions, purchase filing cabinets, and systematize this important part of school administration. 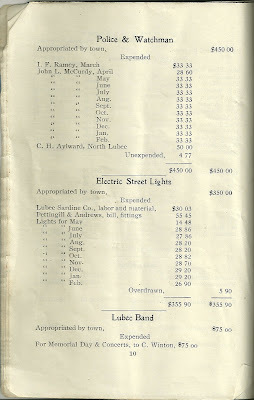 Nearly all cities and large towns of Maine are using these and in a number of states the State Boards make it compulsory to have these. 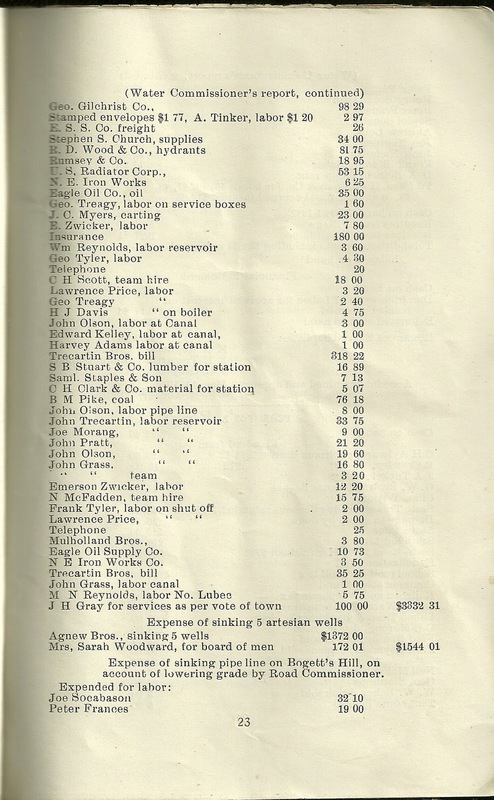 Furthermore, the State realizing the value of Industrial Training, Manual Training, etc., very generously has given towns the privilege, not only of having these branches taught but goes further and offers to invest two dollars to each dollar you expend to procure suitable instruction in these branches. The time has come when it is imperative that we furnish for the children a training which can be used to secure dollars and cents and unless we can teach children that which can be economically applied, our schools are to some extent a failure. 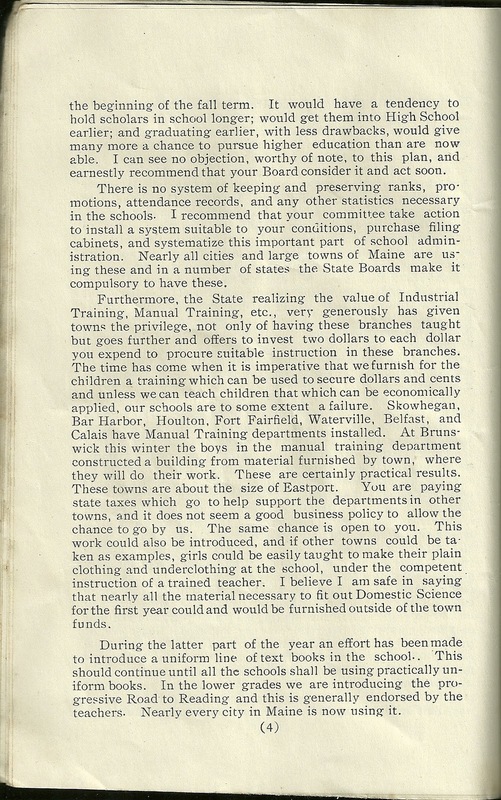 Skowhegan, Bar Harbor, Houlton, Fort Fairfield, Waterville, Belfast and Calais have Manual Training departments installed. At Brunswick thi swinter the boys in the manual training department constructed a building from materials furnished by town, where they will do their work. These are certainly practical results. These towns are about the size of Eastport. You are paying state taxes which go to help support the departments in other towns, and it does not seem a good business policy to allow the chance to go by us. The same chance is open to you. 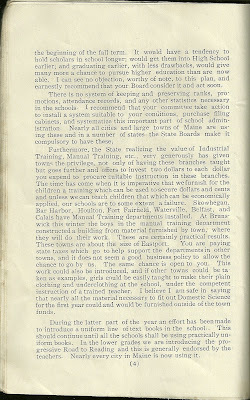 This work could also be introduced, and if other towns could be taken as examples, girls could be easily taught to make their plain clothing and underclothing at the school, under the competent instruction of a trained teacher. 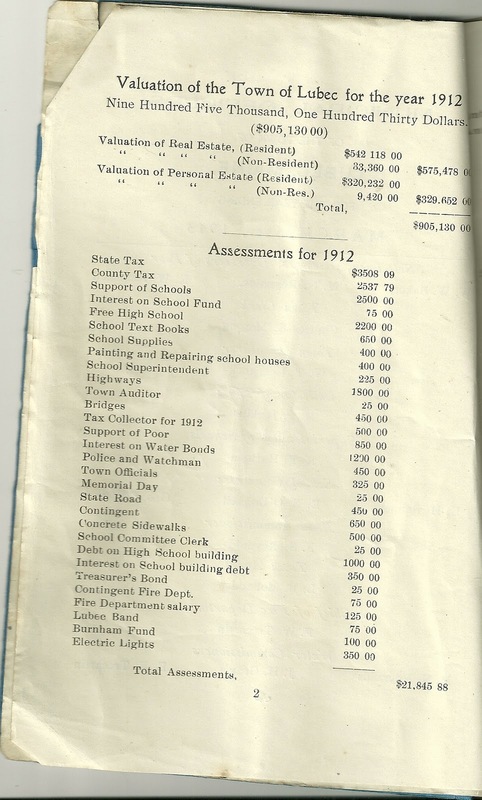 I believe I am safe in saying that nearly all the material necessary to fit out Domestic Science for the first year could and would be furnished outside of the town funds. During the latter part of the year an effort has been made to introduce a uniform line of text books in the school. This should continue until all the schools shall be using practically uniform books. In the lower grades we are introducing the progressive Road to Reading and this is generally endorsed by the teachers. Nearly every city in Maine is now using it. 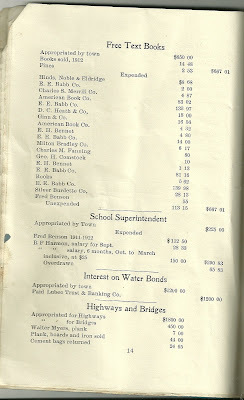 The thanks of the school Board and the town should be extended to the local W. C. T. U., who during the year have placed in the schools a complete set of the Gulick Hygiene Series of Physiologies. There should be an office where the superintendent could make appointments, keep records, and keep in touch with the work relating to that department. In closing, I wish to express my appreciation of the support and help afforded me by the Board. Your oversight has been called for more than usually by the conditions. It has been my aim to carry out your instructions in all matters relating to the management and administration of the schools. But after all, we must place our highest trust in, and render thanks to our teaching force, for we cannot have good schools without good teachers. It is to their work that appreciation is due to a great degree. I wish them to know that I feel this, and I give them my sincerest thanks for what they have done for the betterment of the schools. 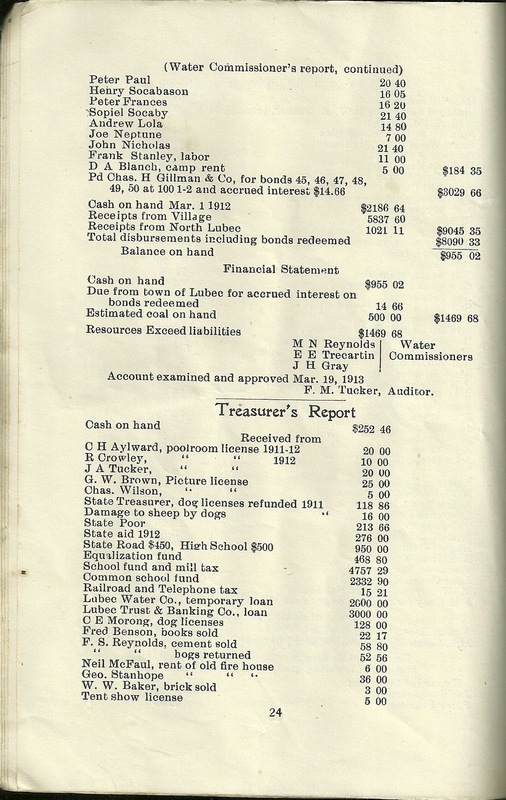 As Principal of the Lubec High School I herewith present my fifth annual report. Of the pupils enrolled in June of last year, all but three returned to school in September. 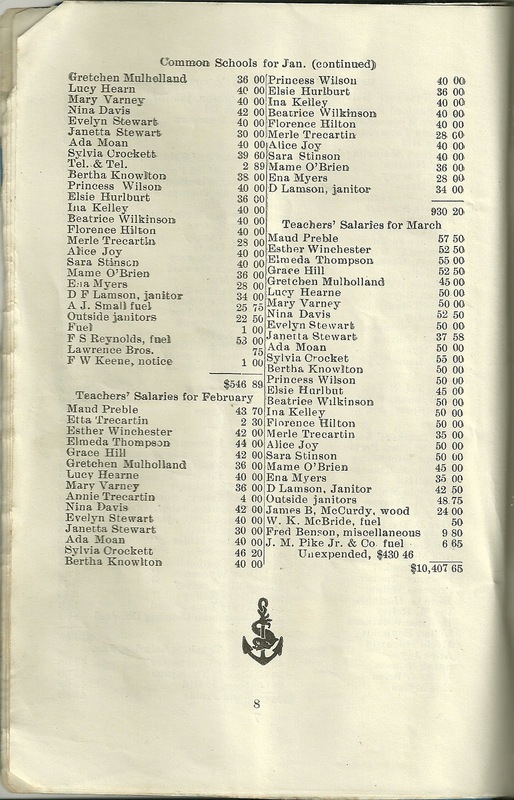 The entering class numbered forty-two, making a total membership of one hundred and fifteen. Since then there pupils have been registered, one only temporarily and two more are expected next term, so that by the end of the school year there will have been registered one hundred and twenty pupils. 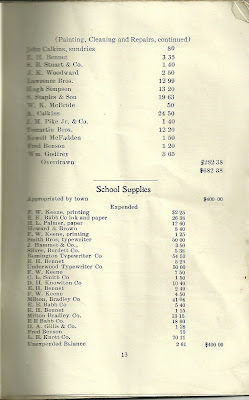 Of this number the school has lost five, two, because of ill health, one was transferred to another school, the family of another moved out of town, and the fifth simply dropped out. Fifteen pupils will be graduated in June, and with an entering class of probably forty, there should be, allowing for dropping out, one hundred nd thirty-five or forty pupils in the school next year. Five well equipped teachers should be ablelto take care of this number of pupils. Such an increase will severely tax the seating capacity as the rooms are already comfortably filled. The course of study adopted three years ago has been found to be workable and has been pursued this year. There are two changes which would be advantageous. One would be to introduce into the English and Commercial branches of the freshmen year the "First Year Science" which has been adopted by many high schools. Such a course is good because it is practical and it leads logically up to the science work following in the third and fourth years of the English course. Another change would be to strengthen the commercial course in the last half of the senior year. Changes have been made in the following text-books: - Algebra and Geometry in the junior year, Rhetoric in the Sophomore and Junior years. In the coming year the Algebra and Rhetoric used in the first year should be changed, and also the Geometry used in the second year. With these changes all the books in the school would be up-to-date and practical and would be such as would meet the requirements for some time to come. 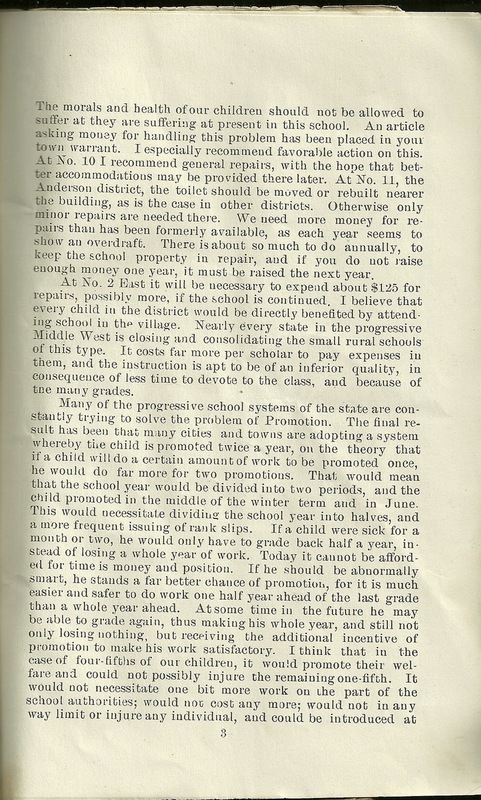 The weather, and the prevalence of the "grippe" has somewhat interfered with the attendance, but considering that there are fifty pupils coming from out of town, there is little cause for complaint. 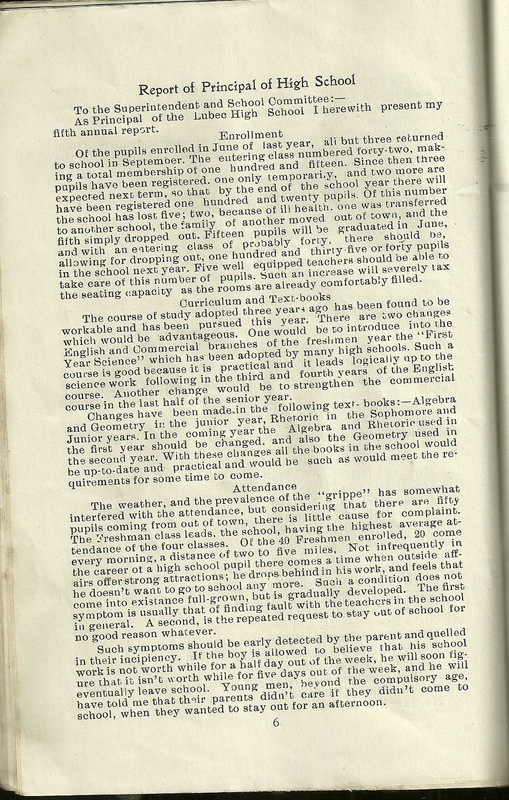 The Freshman class leads, the school having the highest average attendance of the four classes. 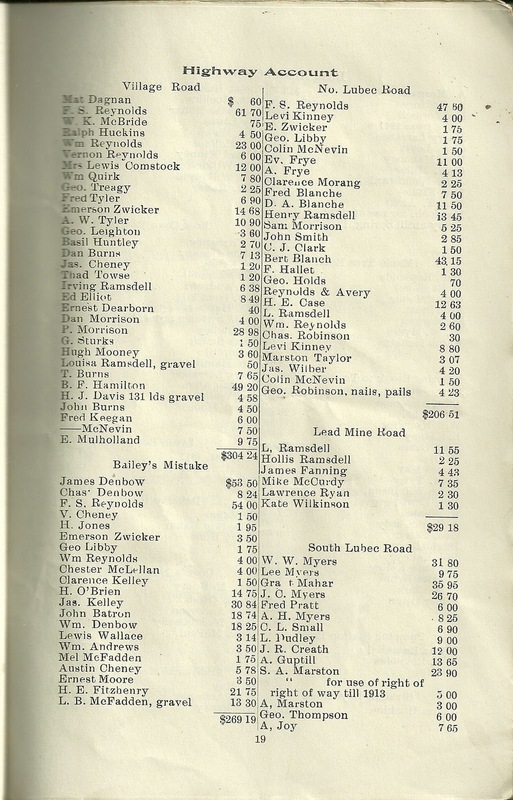 Of the 40 Freshmen enrolled, 20 come every morning, a distance of two to five miles. Not infrequently in the career of a high school pupil there comes a time when outside affairs offer strong attractions; he drops behind in his work, and feels that he doesn't want to go to school any more. Such a condition does not come into existence full-grown, but is gradually developed. The first symptom is usually that of finding fault with the teachers in the school in general. A second is the repeated request to stay out of school for no good reason whatever. Such symptoms should be early detected by the parent and quelled in their incipiency. If the boy is allowed to believe that his school work is not worth while for a half day out of the week, he will soon figure that it isn't worth while for five days out of the week, and he will eventually leave school. Young men, beyond the compulsory age, have told me that their parents didn't care if they didn't come to school, when they wanted to stay out for an afternoon. With such an attitude at home, what can school authorities do? Fortunately such parents are in the minority, yet few as they are, they are failing to fulfil their obligations to their children and to their community, and are therefore a menace to society. Daily attendance is absolutely necessary to efficient work in school and nothing but unavoidable circumstances should be allowed to interfere with it. This point cannot be emphasized too emphatically. The High School was represented last year in the W. C. B. B. League and won third place, Calais and Washington Normal taking first and second, respectively. The team consisted very largely of new material which cannot be worked up in one season. By graduation the school lost four players and this will necessitate working up more new material. It will be a great help if a coach could be employed for at least three weeks in the spring but it is doubtful if the financial standing of the Association will make it possible. It gives me the greatest pleasure to say that this year the school has been visited by nine citizens and five of these have been parents, four mothers and one father. This is an unusual record. 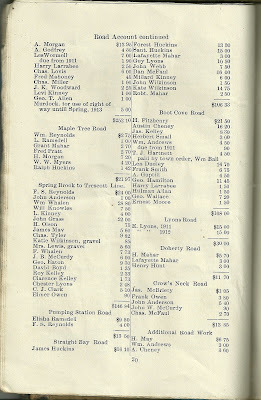 It is also a fact worthy of mention that these parents are all from out of town; two from North Lubec, two from West Lubec, and one from South Lubec. Cooperation between the home and the school is a grand delusion when the parent knows absolutely nothing of the conditions under which his child works for five hours out of every day. 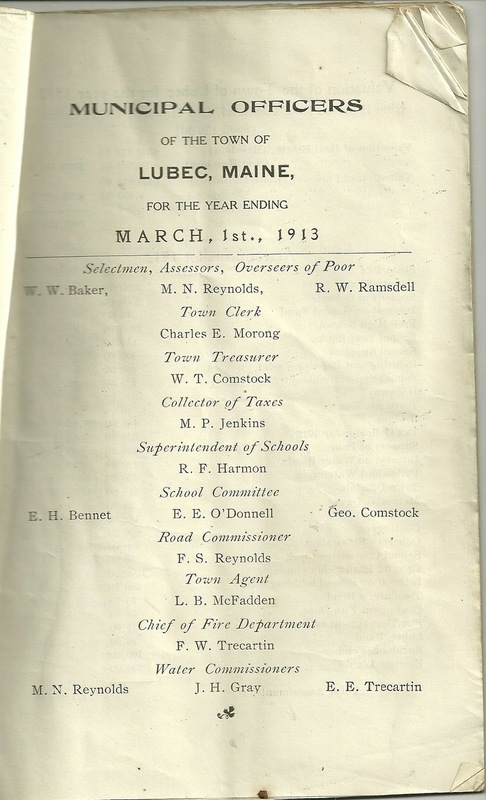 We have understood that the Lubec Improvement Society hs formed a committee on Education. We hope that this committee may find time to visit the schools often and to bring along many parents. People from out of town who have visited the school have frequently commented very favorably on the work they have seen being done. While these things mean much to us, especially when they come from people well acquainted with high school work, they would mean a great deal more if expressed by members of our own community. or of the adult and if the children are taught how to play and what to play they will have some idea of directing their own energies when left to themselves. The town could not do anything more to its credit than to purchase a play ground, and to equip a room with gymnastic apparatus which could be used, under supervision, on stormy days and at any other time that seemed advisable. 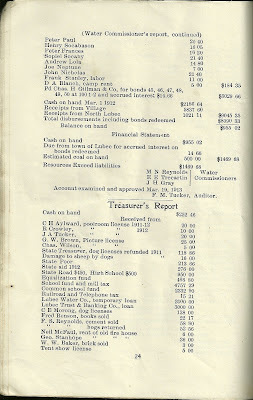 This is no more than the children in other places enjoy and the Lubec children are equally deserving. In conclusion I want to thank the school board, the assistant teachers and all the citizens who, by their support, advice and encouragement have helped to make the school work effective and succesful. 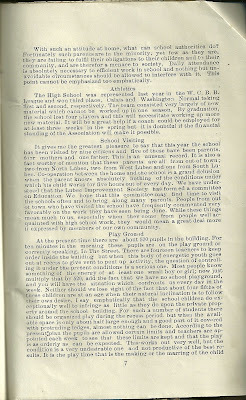 To those who have been somewhat quick to criticize often without understanding at all the conditions they are criticizing, I would like to quote from an address given at the Boy's Convention at Portland, last February, by Carl E. Milliken, president of the Maine Senate. Certainly no one needs help and encouragement, or as Mr. Milliken puts it "To be lifted" any more than the teacher in the school, and the entire School Board. To quote:-"The good citizen is the man who lifts those around him, and he is better in proportion as he pulls more and pulls higher. The mean citizen is he who pulls down those around him, and he is meaner in proportion as he pulls more of them down. Citizenship means working together to help some other fellow who needs to be lifted."